VGA documentation, I need your input. Somehow in creating the VGAplus and Pocket Mini Computer projects I accumulated a pretty detailed collection of both VGA software and access to people with extensive VGA programming abilities. Up to now, I've done a few game demos and even some simple game tutorials. There's even a forum dedicated to Propeller Gaming once again at forums.propellerpowered.com. There is so much good information here which is being buried under forum posts in both Propellerpowered and Parallax forums. I've committed myself to doing some VGA documentation centered around the Micromedic contest and I could use some input on what you all would find most useful. Here's what I'm working on. 2) Object breakdown: A list of methods with descriptions of their use for objects starting with simple VGA text objects into the more advanced graphics drivers. 4) Howtos for supporting software where required. I could use some input from contest participants on what parts of this (or other items) which would be useful to you. Just to give you a better idea of where I'm going.. The first demo I'm working hopefully will look something like this..
Can the propeller do a display like that? Very cool idea!. 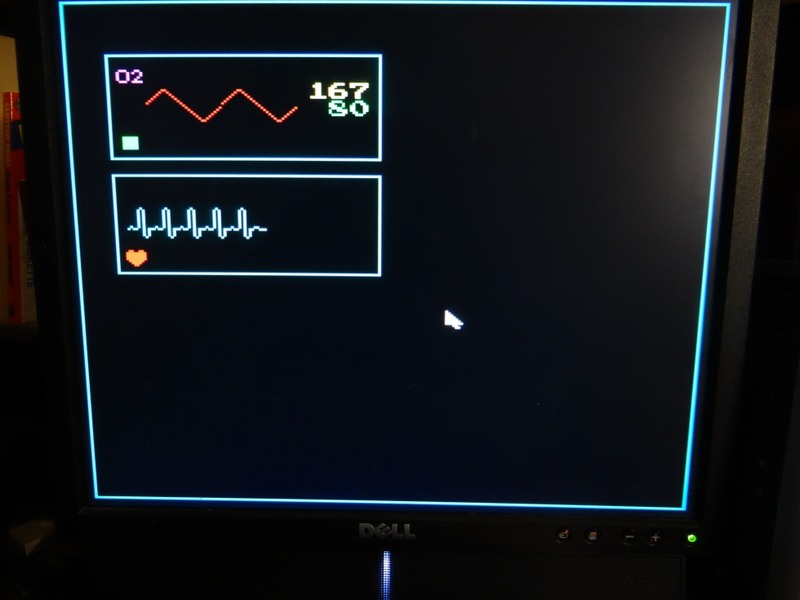 A decent patient monitor with appropriate presets can turn a regular dummy into a lot of functionality that the really expensive models have. Mostly you don't need multiple colors in the same place as different colors are present in specific areas of the screen, but there is usually no multicolor overlap on the same parts of the screen. Consider using a tile based approach for color palate. This would allow you to do 320x240 in mono with 9.6k or 640x240 within 19k and take 1k more to account for color tiles and then 4-5 K for drivers and you still have up to 8k for your program. You could probably duplicate much of that display and still stay within standard memory for a prop 1. You may want to look at the display features that 4dsystems [reference SPARKFUN: You can also use the Visi-Genie in Workshop 4 combined with the Arduino Library to create a graphical interface in minutes! http://www.4dsystems.com.au/prod.php?id=172] provides as an example of the types of meters/GUI's that developers may need. The display you are wokring on is very nice but is it for the staff or the patient? I think that thing that caught my eye at first was the EKG (ECG) section, six QRS's (with the sixth a bit short in time) and then a missing QRS. Is it possible to have it HIGH-LIGHT the missing signal? I've purchased the 4D systems displays and honestly don't like them. They are really optimized for their own embedded scripting language which is a bother. The serial command interface stuff isn't that friendly. I'm more inclined towards Rayman's 256 color VGA adapter, C3Synapse w/ video, living with 32k or waiting for prop 2. Well, I'm about halfway into the characters and sprites for a VGA patient display. I'd estimate I'm at about half the quality of the original image I posted. It'll be fair enough for simulation, but won't compete with modern "in the field" displays I've seen in used in hospital rooms. All in all, considering that last year this time Propeller VGA was limited to text display and very limited graphics, I'm still pleased in spite of it. I'll finish up a demo soon. Do you have any idea of how much CPU time is consumed with the display activities? Fast routines may just DMA copy sections of ram, slower routines may spend a lot of time computing a pixel locatio9n to change it, as the screen/image updates. Can't wait to see some images! I started working on some useful functions this morning. A BOX routine, added DEC, LOCATE, and COLOR commands so now it's capable of displaying some actual data. 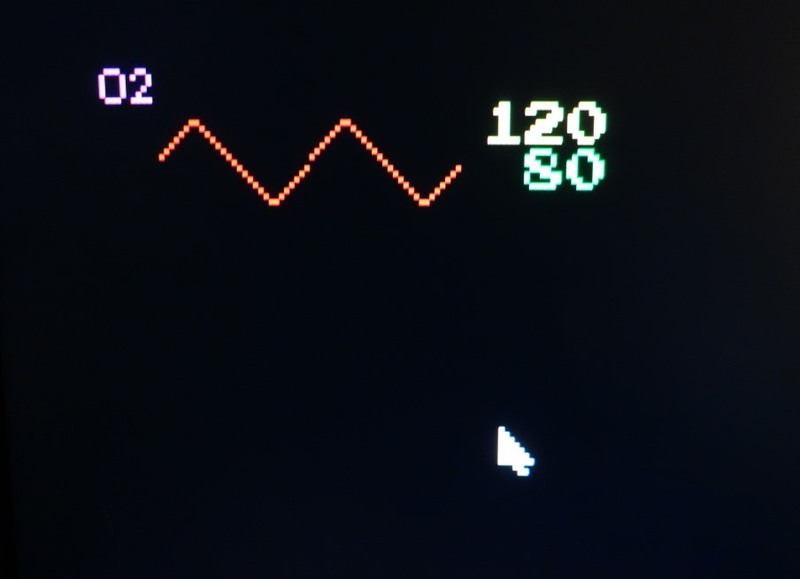 It's all a little "video gamey", but not surprising since this VGA object was written with that intention. As soon as I get some actual mouse movement and add a few more sprites, I'll do a demo that actually does something and post it.